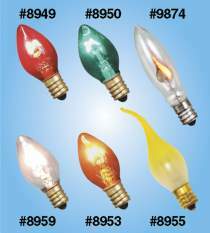 Steady burn translucent bulbs are available in a variety of colors. #9874 flickers with a soft orange flame (3 watt). All bulbs have candelabra bases.